We Claim this Planet in the name of Transylvania! The flag around the world. Ah sweet Transsexual, land of night, far away in the galaxy of Transylvania. We want you to know you are still our beloved planet, even though we are far, far away here on Earth. Pioneer Commanders Tim and Claudine (those being their undercover Earth names) started this by sending a photographic recording of the first place that we have claimed in your name. A small hill called "Ben Nevis". We need you! Help map the rest of this planet for our people. If you have not brought our flag with you from our planet, make your own one and send us your visual record of where you have displayed it to: IClaimThisWorld timewarp.org.uk. Do not forget to tell us who you are and where the flag was flown. The stranger the better! I have been thinking of putting the famous flag somewhere "Interesting" for quite some time as you know I am usually found in some unusual places but where i finally decided to was actually a bit closer to home in a little village here in the north west. Grappenhall Village. Why??? 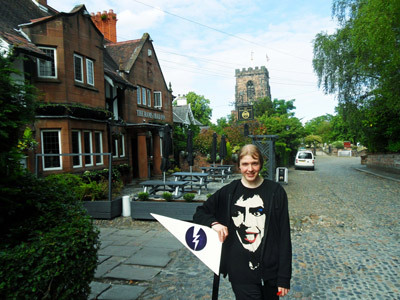 because Grappenhall village is the hometown of Mr Tim Curry!!! Timothy James was born and brought up here and his father James was a church chaplain who worked for the Navy and his mother Patricia was the school secretary. Tim went to high school in nearby Lymm before moving to Somerset after his father died. 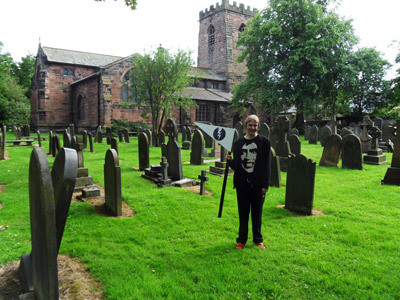 I have attached two images one is more of a view of the little village and the other is the church and graveyard but if you do not want to use two just use the one of the famous graveyard and church please I had tea there with the Cheshire cat ! 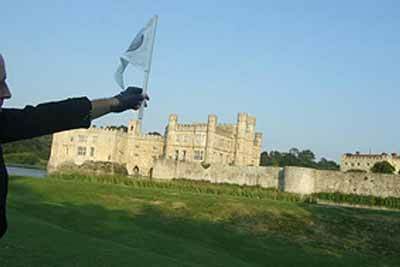 Claudine and Tim decide to claim Leeds Castle as they pass by on their way to the open air screening of The Rocky Horror Picture Show. You can see loads more images about that event in our reviews section. 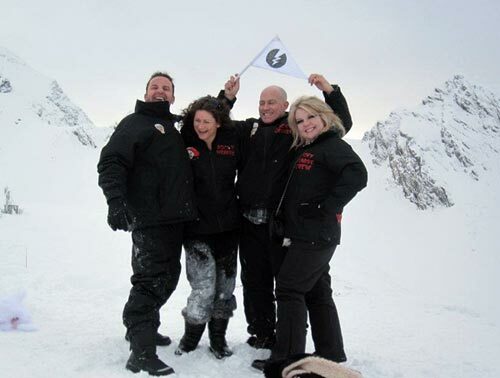 Claudine, Tim, Jason and Mari pose with the flag in the earth country of Romania when they visited the version of Transylvania on this planet. Quote from the brave adventurers: "This was at the highest point we could get to." David of the White travelled to the land of the New Zealands to find the natives had already begun their tributes to the great legend himself, Riff Raff. 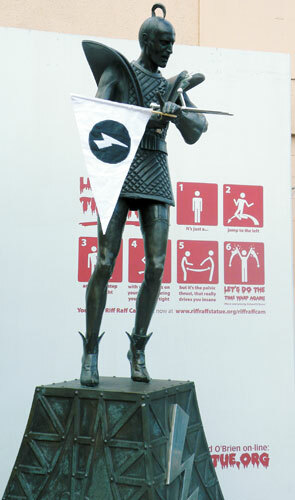 They had built a fine statue and he felt it only fair that the event be marked with our sacred flag. 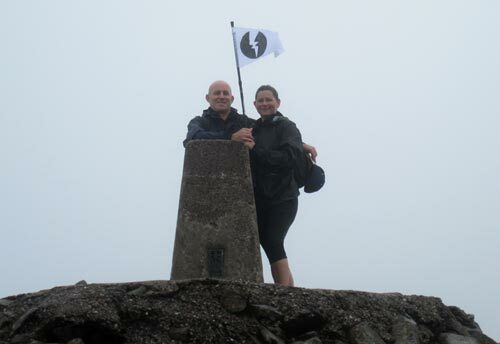 Tim and Claudine fly the flag over this small rock called "Ben Nevis" in honour of all the peoples of the galaxy of Transylvania. We come in peace, but we do have lasers! 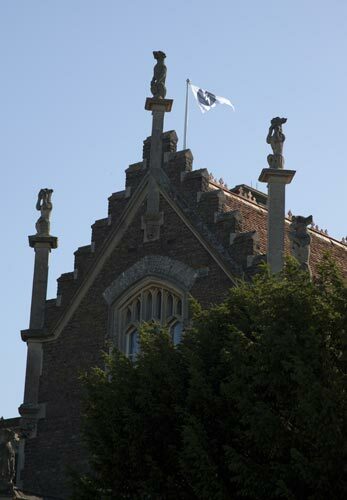 We ourselves have of course flown the flag over Frank's castle several times at our annual Rocky Horror Picnic Show. Of course this was done way back in the earth year of 1974 by the legendary Riff Raff, so has already been marked for our people. Send us your images and help the cause today.